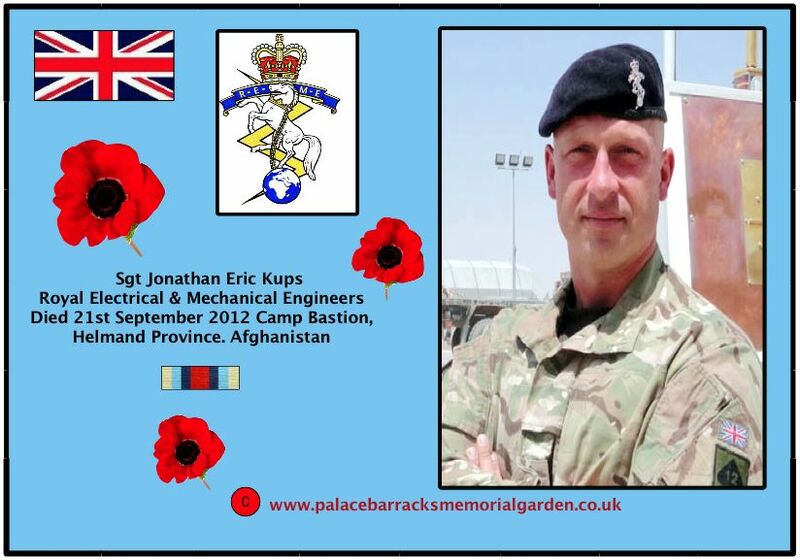 Sergeant Jonathan Eric Kups, of the Royal Electrical and Mechanical Engineers (REME) died in Camp Bastion, Helmand Province, Southern Afghanistan on Friday 21 September 2012. Sergeant Kups was from Nuneaton, Warwickshire. He was born on 28 October 1973 and joined the Royal Electrical and Mechanical Engineers in June 1992 where he trained as an electronics technician. In the early years of his career, he specialised in radar and ground to air weapons, completing an operational tour in Northern Ireland. As he progressed through his career he turned his expertise to the operation and repair of Electronic Warfare systems, subsequently completing a number of deployments with 14 Signal Regiment (Electronic Warfare). In 2011 Sergeant Kups moved to 104 Force Support Battalion REME before being attached to 4 Close Support Battalion REME for its deployment on Operation HERRICK 16. With his vast experience, Sergeant Kups was able to effectively lead and develop his soldiers in a very busy electronic repair section. A man of considerable military experience, Sergeant Kups was well respected by his section and by the unit as a whole. Sergeant Kups’ untimely death is a great loss to his family and the Corps of Royal Electrical and Mechanical Engineers. He leaves behind his wife and three children. “Sergeant Jonathan Kups, or ‘Koops’ as he was known, arrived at the Battalion in 2011. A real character, his dry and quick witted sense of humour made him a pleasure to work with and he was extremely popular across all the ranks. “A man of real substance, Sergeant Kups’ maturity and considerable experience enabled him to quickly become a vital member of the Electronics Platoon. Without delay he made an immediate impact within his Company, developing and training his soldiers and ensuring that they were all fully competent and able to deliver essential electronics support in Afghanistan and back in the UK; his clear and dynamic leadership guaranteed success. “He immersed himself in all aspects of Battalion and Company life and I swiftly recognised him as one of my ‘go to’ Senior Non-Commissioned Officers (SNCOs) when a task needed completing quickly, efficiently and to the highest standard. “Sergeant Kups joined the Battalion in late January 2011 as we started the final preparations for our deployment on Operation HERRICK 16. From the start he made a strong impression. “Technically brilliant, he invested considerable sweat and tears in developing his technicians ahead of the deployment and his efforts reaped significant success. At the centre of electronic repair in Theatre, he drove his team hard to ensure those soldiers deployed forward had the equipment they needed – he was never found wanting. 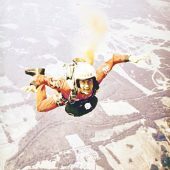 “Confident, with bags of humour, he was a SNCO who lived life to the full. His enthusiasm was infectious and he cared passionately for the technicians within his team. He was the father figure and his soldiers loved him for it. “Sergeant Kups embodied all that is best as a SNCO, a technician and a fellow in arms. His experience, maturity and team spirit secured his position as the man to get things done in the Electronics Platoon. “Quick witted and light humoured he secured a place in the heart of the Company and will always be remembered for his broad smile and confidence. Sergeant Kups made a real impression on all who met him. He led from the front setting the standard and dedicated much of his time to mentoring his subordinates. 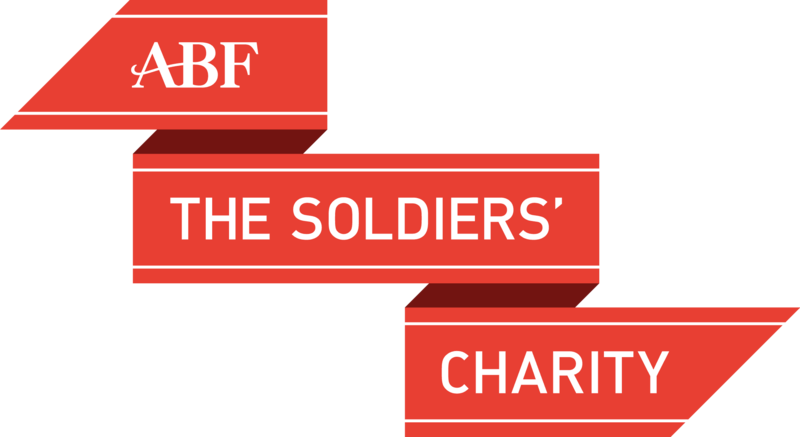 “Sergeant Kups joined the Battalion in January 2011 from 104 Force Support Battalion REME to deploy on Operation HERRICK 16. He commanded the Electronic Counter Measures (ECM) repair department within the Equipment Support Battalion providing a pivotal role in the support to operations throughout the tour. “His technical ability was second to none providing regular advice to his Platoon Commander and in developing the junior technicians. He was a strong, resilient and robust character who was a loyal defender of his section. His support to his team throughout the tour never wavered, providing guidance both professionally and personally. “Sergeant Kups joined General Platoon in January 2011 on attachment from 104 Force Support Battalion, augmenting the technicians’ section with his specialist skills as an ECM maintainer. Fiercely proud of his section and the work that they produced I could not have asked for a better SNCO at the helm. “An Artisan Sergeant through and through he would always tell it like it was. It was this direct yet often humorous approach that I came to value from him. A highly capable and experienced tradesman I could always rely on his timely advice and guidance. “When not at work Sergeant Kups could be found doing some form of physical exercise, he always found time for his daily training sessions. He had taken some of the junior members of the section under his wing, mentoring them in the gym to great effect. “Sergeant Kups was a robust SNCO, always standing up for his beliefs no matter what the opposition or confrontation. Never one to sit on the fence his honest opinion was always given, often with his trademark dry sense of humour. It’s a pity you don’t have a donate button! I’d most certainly donate to this brilliant blog! I suppose for now i’ll settle for bookmarking and adding your RSS feed to my Google account. I look forward to fresh updates and will talk about this website with my Facebook group. Talk soon!